It is said that every one of us possesses a single talent, however insignificant, in which we surpass all others. Someone is the best chess player, the best no-limit Hold ‘Em player, the best parallel parker in the world. David Rosdeitcher is the best in the world at one thing. He called me today asking my advice. David told me he received a letter from the Global Processing Group informing him that he had won $50,000. There was something wrong with the letter, David said, something few people besides David would notice, but enclosed was a check for $2962.30. The instructions were to cash the check, then take the cash to Wal-Mart and buy a Moneygram to send to Canada to cover the processing fees. He successfully cashed the check but when he went to Wal-Mart the clerk told him it sounded like a scam, so he called me. “Did you cash the check at the bank it was drawn on?” I asked. No, he said, he took it to his bank. “Then you didn’t cash the check,” I said. You deposited the check and withdrew your own money. Sure as snow in Colorado that check would soon bounce, leaving him stuck. Oh, he said. I Googled the salient points and came up with a long thread about this scam but if David had sent the Moneygram it would have been too late. Good thing the Wal-Mart clerk was on the ball. And good thing David noticed that the postal code given for the address in Calgary, Canada, was actually a code for Montreal. 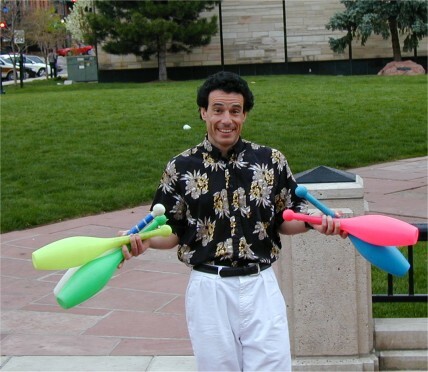 You see, David is a juggler, but that's not his world-class talent. David Rosdeitcher is better known as the Zip Code Man. He has memorized every zip code in the world and holds the Guinness record for most random zip codes correctly identified. David thanked me, then asked my advice on another matter. He was thinking of taking up a new career. These scammers play a numbers game. How many people are going to believe they've won something and all they need to do is to wire some funds for the administration? Thousands of people will not fall for it, but it takes one to believe it for the scammer to win.